A pair of AN/ALQ-119(V) ECM pods ready for loading on the aft station of F-111Fs. AN/ALQ-87 ECM pods were used by F-111As based in Thailand during both the Combat Lancer and Constant Guard V deployments during the Vietnam War. Two were mounted on the forward (weapons bay) and aft fuselage stations. Although they could also be mounted on the F-111E or F-111F, they were retired form service by the mid-1970s. 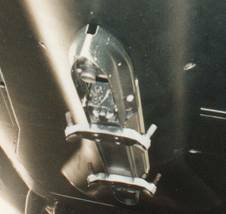 (above) The AN/ALQ-87 ECM pod was mounted on the forward station directly behind the gun fairing, but offset to the right side of the centerline by eight inches. (above)The ECM pod fairing is shown at left mounted on an F-111F Pave Tack cradle. It was more commonly seen mounted on the aft station, as shown at left. This fairing was also used to mount the AN/AXQ-14 data link pod used by the GBU-15 and AGM-130. It is shown on an F-111F, but was also used to mount ECM pods on the F-111A/D/E (front is left). The medium (115-inches long) and long (143-inches long) variants of the AN/ALQ-119 (and later, the externally similar QRC 80-01), replaced the AN/ALQ-87 in the late 1970s. Used by the F-111A, F-111E, and F-111F, they were the only ECM pods the F-111D was ever operationally equipped with. 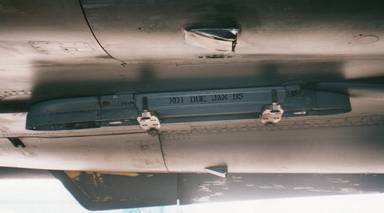 (above) The long QRC 80-01(V)3 ECM pod, shown mounted to the aft station of an F-111D, was externally identical to the AN/ALQ-119. this was the standard pod used by F-111Ds. Shallow variants of the AN/ALQ-131 were introduced on F-111Fs, and then F-111Es during the early 1980s. While normal carriage was on the aft fuselage station, F-111Fs sometimes carried it on the Pave Tack cradle when the GBU-15’s AN/AXQ-14 data link pod was carried on the aft station. On rare occasions AN/ALQ-131s were used on F-111Ds for special exercises. (above) An AN/ALQ-131 ECM pod is shown mounted on the aft station on an F-111F at left and on the front station of an F-111D (just behind the gun fairing) at right.